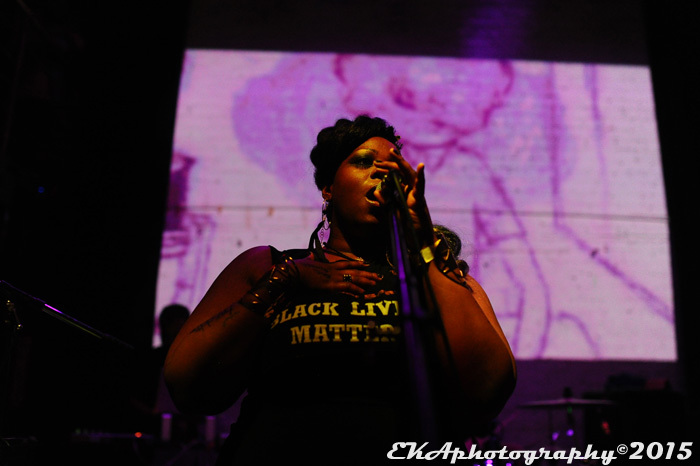 Black women are the new rock stars. That was the take-away from the recent triple-header bill of The Seshen, Bells Atlas, and Zakiya Harris with Elephantine. When was the last time you saw a lineup with bands all featuring black female frontpeople? The bill worked because all three acts have a similar sound; one could call it a trend, but it seems more like an unintended coincidence. If we are witnessing the birth of a new genre, let’s call it Emo-Soul. That sounds much better than “Trip-Hop, take two” and avoids the awful, inorganic “neo” prefix applied to urban soul music since the late 90s. Emo-Soul is emotive and soulful; it utilizes electronic treatments and ambient soundscapes to counterbalance the plaintive yet raw emphasis on female vocals. Live instruments are a deciding factor in the Emo-Soul sound, distinguishing it from discofied electronic club music. But there’s something else which is created when it all comes together: a tribal-like sense of togetherness, of holding disparate elements together to form a cohesive whole. It’s rare to see a show where any of the acts on the bill could have headlined, but this was that show. An obvious reference point for the Emo-Soul sound is 90s act Morcheeba, who contrasted upfront soul diva musings with ethereal, atmospheric backgrounds. Emo-Soul revisits that period, but provides something new. Or maybe it’s just that the context has shifted, and there’s a more recent immediacy with hearing the voices of black women – call it the #blacklivesmatter effect. This show’s trifecta of women straight up handling thangs in a live context served as a reminder that social justice can extend to a cultural platform as well as a political one. Zakiya Harris has been on a roll recently, but this might have been the best show yet for her band Elephantine. Although Harris is the featured frontwoman, Elephantine’s sound is very much an ensemble sound which relies on vocal interplay between Harris and singers Tossie Long and Solas B. Lalgee, backed up by musicians Kevin McCann, Ajayi Jackson, and Rashad Pridgen. Their Facebook page describes their music as “Afropunk/Afrobeat/Afropop,” none of which are perfect descriptors. Elephantine is too smooth to be punk, too compact a band to be Afrobeat, and too urban and Americanized to be Afropop; The Afro- part of their sound is mainly reflected in their Afrocentric attitude. With Lalgee absent due to a concurrent gig with the Oakland School for the Arts, Long got some extended stage time, which seemed apt, as it was her birthday. What was most impressive, though, about Harris and Elephantine was their ability to create a mood and set a vibe which engaged the crowd. No matter how emotive a band might want to be, it doesn’t mean diddly unless it translates into audience acceptance. Harris and Long were clearly feeling themselves—but so were the people watching them and hearing their music. Bells Atlas came next, and delivered on all the hype surrounding them. They describe their sound as “kaleidosonic soul punch,” whatever that means. In this context, it means they picked up the gauntlet thrown down by Harris and Elephantine and raised the energy level even higher. 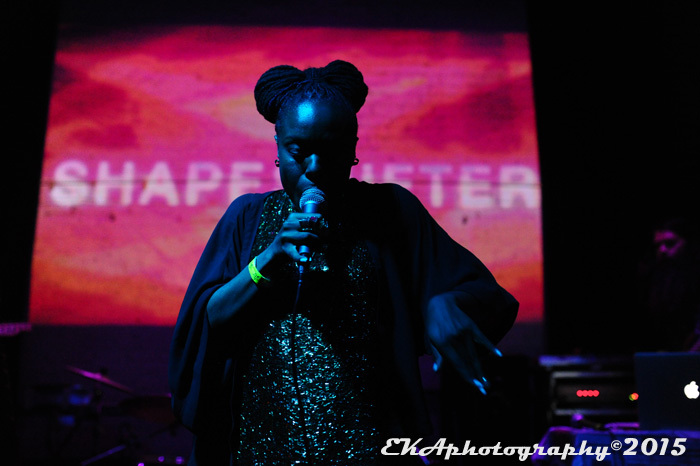 Frontwoman Sandra Lawson-Ndu was simply divalicious, dropping poetic lyrics which came from a galaxy beyond overly-simplistic R&B, while maintaining a spellbinding stage presence. Fine-tuning the hall’s emotional resonance like aural MDMA, Bells Atlas’ sound made you want to love your neighbor, or at least give them a tight hug. 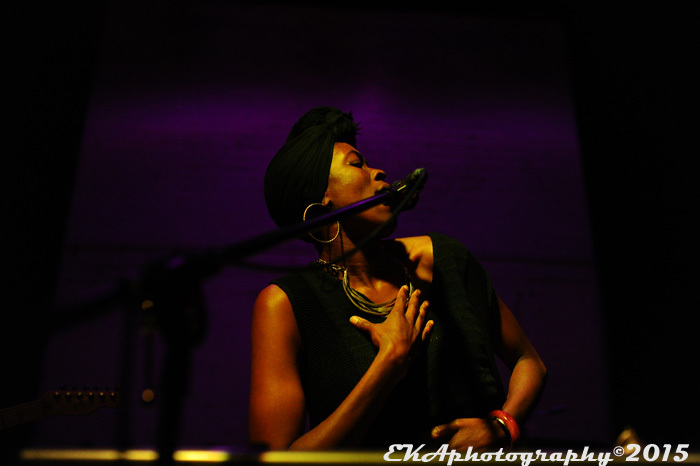 It’s no easy task to make the unfamiliar seem familiar, but Lawson-Ndu was so locked into her groove, she accomplished that with ease, assisted by guitarist Derek Barber, drummer Geneva Harrison, and bassist Doug Stuart. Lawson-Ndu’s fluid voice has plenty of elasticity to twist around lyrical phrases and sounded particularly tasty when trilling the upper register. It’s a potent weapon which was thankfully the focal point of the band’s presentation. If Bells Atlas’ musical backgrounds seemed like a lush rainforest of alternative, yet not inaccessible, tones and melodies, Lawson-Ndu’s vocals were a tropical waterfall of soulful expression. It’s rare to see a show where any of the acts on the bill could have headlined, but this was that show. The top-billed Seshen are another buzz band who have been building up a following (which extends outside of the Bay; the group has signed to UK label Tru Thoughts), and like the two acts who preceded them, fit into the category of Emo-Soul: a vocal-heavy sound with both electronic and organic elements. 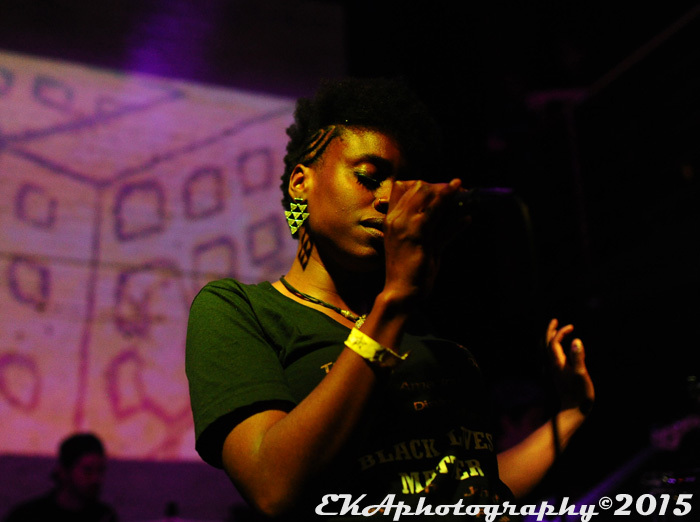 At the center of The Seshen’s dynamic is the interplay between vocalists Lalin St. Juste and Akasha Orr. At times, they resemble a Supreme-esque soul duo from the 60s, but with a much more modernistic, even futuristic, take on things. Then again, they could also be called retro in the sense that they do recall the high points of the Trip-Hop era, which, again, revolves around emotional resonance – and in The Seshen’s case, percussion and dub effects instead of electric guitar. On a night when black (female) voices were triumphant and reigning, St. Juste and Orr both wore “Black Lives Matter” t-shirts, emphasizing the point that soulfulness begins with compassion. Categories: Events, Music Review | Tags: ambient, Bay Area indie music, Bells Atlas, Black Lives Matter, electronic, Elephantine, Emo Soul, female vocalists, Morcheeba, The Seshen, Trip Hop, Zakiya Harris | Permalink. and video but, these demand a connect-in installation).